The challenges faced by the new management of Kampala City are enormous. But unlike the old management at City Hall, the new one has unprecedented support from the highest office. It was obvious that the newly appointed Kampala Capital City Authority (KCCA) Executive Director has President Yoweri Museveni’s goodwill to deal the mess in Kampala a last blow. What was not known was to what extent Ms. Jennifer Musisi Semakula’s presidential backing goes. It has now been revealed that she has his purposeful and determinedly unwavering support, and the President will not let anybody stand in this lady’s way as she goes about her duties of bringing back sanity to Uganda’s capital city, making her the President’s newly found blue-eyed girl. “I have appointed this woman Musisi to clear up the mess that has been caused by the opposition in Kampala city management for decades, and you people should just wait and see what she is going to do,” Museveni told the people who gathered at Kkindu Catholic Church grounds for the thanksgiving celebrations on July 25. He went on that he at first wanted to appoint Musisi as a judge, but the lady turned down that offer because she was running a private business and did not want to have a conflict of interests while serving in the judiciary. He praised her for the work she did in cleaning up the dirt in the Uganda Revenue Authority (URA). “This woman helped me clean up URA which was dogged by corruption, and it is going to be a matter of time before this mess in Kampala becomes history,” Museveni said amid ululations. He added that all through the years, the old city management had the machines and the money to fix the pothole-riddled roads in Kampala but those responsible kept those machines parked in yards and instead resorted to stealing the money and fuel which was meant to run them. Musisi has of late been under attack from different corners, but the biggest challenge so far which many thought was insurmountable and would probably break her was the one in which she asked Gen. David Tinyefuza, the Coordinator of the security services, to vacate a building which he is using as his offices in upscale Kololo. This building, the ED said, belongs to KCCA and is supposed to be the official residence of the Mayor of Kampala, but was handed over irregularly to the General by the old Kampala City Council (KCC) authorities under the leadership of the now embattled former Mayor Nasser Ntege Sebaggala. After receiving the eviction notice, the battle-hardened Gen. threatened to arrest Musisi if she ever dared try to carry out any eviction, saying that he was using the building for “national security purposes.” Indeed, the tough-talking Tinyefuza “invited” Musisi to go carry out the eviction and wished her “success” as security at this building was beefed up with mean-looking and gun-toting soldiers which no ordinary KCCA law enforcers and police could ever dare engage. Musisi dismissed Tinyefuza’s threats and vowed to go ahead with doing what the law requires her to, and that is, to be the custodian of KCCA properties. 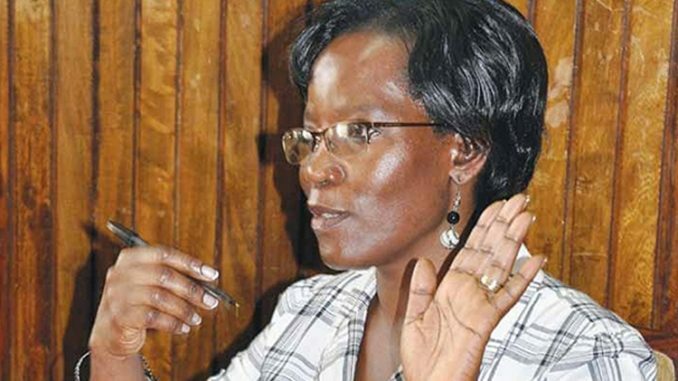 Public opinion was also swung towards “Camp Musisi,” because she was now seen as the biblical “David” fighting impunity against the all-powerful and armed-to-the-teeth “Goliath” Tinyefuza. The battle lines have been drawn and we are yet to see the victor walk away from this fracas. Many observers were left startled a few weeks back when KCCA went ahead to evict the former Mayor of Kampala Nasser Ntege Sebaggala from the house he claimed he bought from the council with the blessings of Museveni. A few months before the presidential campaigns began last year, Sebaggala who was an opposition politician officially crossed over and joined the NRM at the function when President Museveni launched his manifesto at Serena Hotel. He went ahead traversing the country with Museveni canvassing for votes. It was therefore no surprise when President Museveni included Sebaggala in his cabinet line-up as his Minister without Portfolio, only to fail the filter of the parliamentary appointments committee questioning his integrity and educational background. With the former Mayor already battered and frustrated by parliament from taking his political reward, President Museveni who has intervened before to save his cronies in trouble never came up to interfere with Musisi’s work as “Seya” Sebaggala was embarrassingly thrown out of the posh Sezibwa Road Plot 1 house. Those who wondered at this can now certainly conclude that President Museveni’s remarks in Kyanamukaka reveal that he will blink no eye for any of his cadres or political allies if they happen to cross Musisi’s path. This is what happened to Sebaggala and is knocking on Tinyefuza’s door, therefore the face-off that many anticipated between Musisi and Tinyefuza is not likely to happen as the ground is tilted in the ED’s favour. Although both ED Musisi and Kampala Lord Mayor Erias Lukwago have stated that they both want an orderly and wellmanaged Kampala, they have disagreements on the issue of transportation in the city involving the giant and politically wellconnected UTODA (Uganda Taxi Operators and Drivers’ Association). While Lukwago has argued that the association has no legal contract to run the transport sector in the city, Musisi has asserted that the contract expiring in 2014 is there and was signed by the former Town Clerk David Naluwairo during his short stint at City Hall. Lukwago has asked Musisi to bring forward this contract, but in vain which has left the public speculating that the ED might be illegally safeguarding UTODA interests since this association is said to be one of the ruling party financiers and political mobilizers. Indeed UTODA boss Haji Musa Katongole told Mayor Lukwago to back off UTODA affairs since he could be starting a war he could not be able to finish. Lukwago has been pushing for the cancellation of all agreements between KCCA and UTODA, and wanted their monopoly lifted to allow other players join the industry with the aim of improving service delivery. A group of taxi drivers brought transport in the city to a standstill that paralysed business last month when they went on strike, refusing to drive their taxis for a day protesting illegal fees without receipts that are levied upon them by UTODA, and it took President Museveni’s intervention to scrap the fees. It was after this that the drivers went back to work. A staunch born-again Christian, Musisi has publicly said that she had never thought of serving as the head of Kampala, but her call to service in this city came from God. She recently told a church gathering at Omega Healing Centre in Zana that while going through Newspapers last November, she read that parliament had passed the KCCA bill creating the office of the Executive Director and “a voice told me that I have to take up the position. I looked around and I thought I had lost my mind, I almost fell off my chair.” 12 days later, President Museveni invited her to Gulu and appointed her the ED of KCCA. This notwithstanding, some councilors are not satisfied with the way she is handling her business, and have petitioned President Museveni for an audience pertaining to their grievances “before the situation gets worse.” In a letter dated July 6, the councillors led by Salim Uhuru, the division councillor for Kisenyi, informed the President that their relationship with the ED has deteriorated. They threatened to boycott council activities because of what they refer to as Musisi’s uncooperative behaviour. They insist that the people who voted them into office want services, but the councillors’ efforts to meet Musisi and forge a way forward have all been in vain. “She does not respect us. Can you imagine since she took over office, she has never met us?” Uhuru stressed.